We had been tracking the budding scandal that implicated the office of Japan's Economic Minister Amari. We had expressed our concern earlier this week that the scandal could sap Amari's office strength and be a distraction. However, the situation unraveled quicker than we anticipated and Amari resigned earlier today. He is the fourth ministerial resignation but by far the most important one to resign. Abe's first term had been marred by scandals and they arguably contributed to his short tenure. 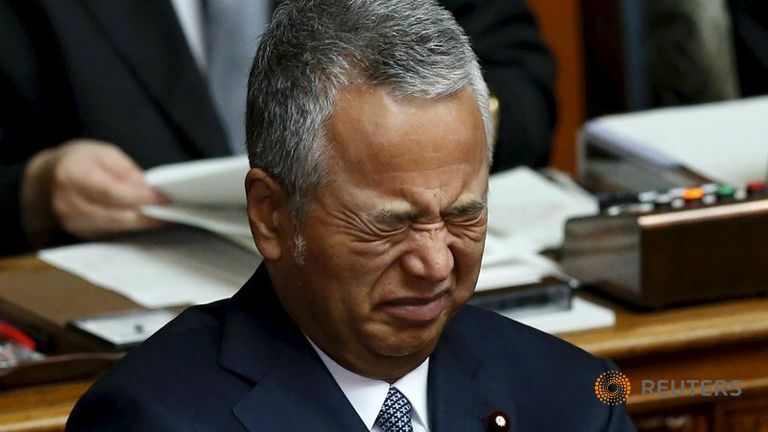 While cognizant that the Abe cabinet is broad and has a number of former prime ministers and senior officials, we sketch out here a few potential implications of Amari's departure. First, in terms of politics, Amari's resignation may change Abe's intentions. An upper house election will be held around the middle of the year. There had been some talk that Abe would dissolve the lower house and call for snap elections at the same time. On the margins, this is now seen as less likely. Second, regarding Abenomics itself, which Amari was an important architect, it likely continues to struggle. A supplemental budget will make its way through the Diet over the next two months. The structural reforms that were associated with the "third arrow" appear to be taking place in a piecemeal fashion. However, the strong profitability of Japanese corporations, helped by the weaker yen, and the tight labor market by most metrics, have failed to boost wages. Higher wages was a keystone of Abenomics. On the margins, Amari's resignation may put more of a burden on monetary policy. Third, Amari was the point man in negotiating TPP and responsible for steering it through the Diet over some domestic opposition. Here Amari's departure may be most keenly felt. Although the TPP negotiators are to meet next week and sign off on the agreement, several parliaments, including the US Congress need to approve it. Moreover, the agreement is such that all must approve for it to be implemented. The new Canadian government has not fully endorsed it. The leading candidates for the US presidency have been critical of the agreement. We do not see direct implications for the yen's exchange rate. As global markets have stabilized after the horrific first two and a half weeks of the year, the dollar has recovered from JPY116.00 to about JPY119.00. The price action has reinforced the importance of the JPY116 area, which is where the dollar also bottomed last August. The dollar's technical condition against the yen is improving. The five-day average has crossed above the 20-day average earlier this week for the first time since the first half of December. The RSI and MACDs are moving higher. A move above the JPY119 area would give the greenback scope toward JPY120.00-JPY120.50. The US 10-year premium over Japan peaked at the end of last year near 2.04%. It fell to almost 1.76% in the middle of last week. It has not risen much, but the downward momentum has been broken, and that alone seems sufficient to lend the greenback support. The Nikkei is off 10.5% so far this year. Here too the technical tone is constructive. It bottomed last week near 16,000 and despite the decline, earlier today is holding above 17,000. We think the most immediate technical development to pay attention to is the gap created by Wednesday's higher opening. The gap is found between 16830 and 16947. The gap was not entered today as the Nikkei traded within yesterday's range for the entire session. The gap is important because it helped create a potentially bullish island formed this past Tuesday.